If developing a cool gadget using the Raspberry Pi 3 seems like an insurmountable challenge, Microsoft's got your back. Microsoft's IoT Grove Kit has the ingredients needed to make the development of gadgets with Raspberry Pi boards much easier. 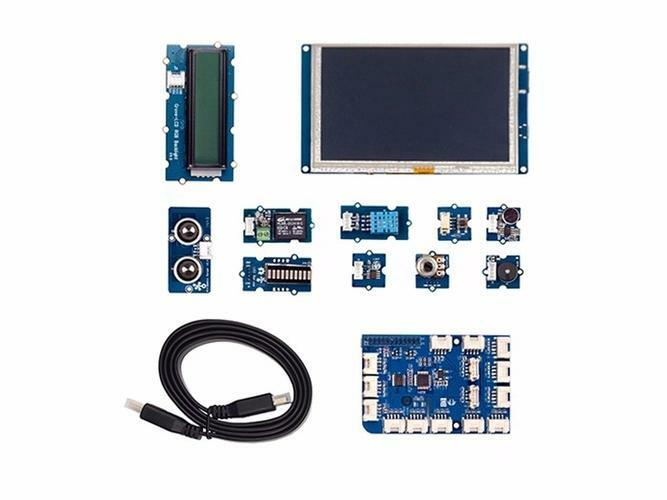 The kit is a small collection of must-have components and connectors commonly used in making smart devices, drones, or robots. It doesn't come with the Raspberry Pi 3 board, which can be acquired separately for US$35. The kit is listed for $154.99 on the websites of online retailer Digi-Key and Seeed Studios, with which Microsoft co-developed the product. A shipment date wasn't immediately available. The kit has a 5-inch HDMI touch display, actuators, connector cables, an RGB LED bar, and weather, sound, and light sensors. Buyers of the kit won't have to go through the arduous process of looking for relevant components online. Microsoft announced the kit at April's Build conference, saying it was for those scared of plugging in hardware or electrocuting themselves. Developing gadgets requires basic software programming skills and proficiency in handling hardware, but not all makers have that mix of skills. Microsoft wants to put its Windows 10 OS in more devices outside of PCs, and the kit could help makers turn their ideas into reality. Windows has been used in robots, drones, an LG refrigerator with a transparent display, a facial-recognition door, and other interesting devices. Some components are missing in the kit. For example, it doesn't come with servos, which are important in the development of robots. But it has other components commonly used in robots, home automation products, and IoT devices. Seeed Studios sells many of the components individually, but Microsoft has pulled them all together in one package.